Is There a Cure for Toenail Fungus? Contrary to what is often thought about the source of toenail fungus, the condition is related to minor or major injury, rather than from poor hygiene. This is why athletes are some of the most common victims of the condition. As they engage in sport activity athletes’ toes push up against their shoes, directly jamming nails into the shoe and lifting up the nail for fungus to fester. This seemingly minor injury is most often the cause of toenail fungus–not poor hygiene. Luckily, there are several treatment types and preventative measures available for toenail fungus, depending on its severity. Laser treatments are the newest innovation for eliminating toenail fungus. This method is quick and painless on feet, while still yielding true results. Whether treating mild, moderate or severe cases of foot fungus, laser treatments are effective at curing the condition. Though topical over the counter treatments work for foot fungus infections, such as athlete’s foot, OTC topical treatments do not work on treating toenail fungus. Prescription topical treatments contain stronger ingredients, which is why only your trusted podiatrist can provide the best topical formula. Topical, anti-fungal nail polishes are also effective and available at our Beaver Velley Foot Clinic & Body Beautiful offices. Oral medications, such as the common Terbinafine (Lamisil), get to the root of the nail through the bloodstream. They allow the nail to grow out clear of fungus and healthy. By taking one tablet each day, for 3 months, you can eliminate toe nail fungus from inside. Consult with your podiatrist on whether or not oral medications are an option for you. Going to your podiatrist for regular nail trimmings is a great preventative measure against toenail fungus. This prevents long nails from repetitively jabbing into shoes, also preventing injury. If nails are allowed to become long and overly thick, the toenail fungus is at a severe level and will most likely cause major discomfort and pain. Once this is reoccurring, surgical removal of the nail may be necessary. Remember to avoid myth-filled home remedies; things like vinegar, Vick’s Vapor Rub, or bleach will only result in chemical burns and ineffective treating. 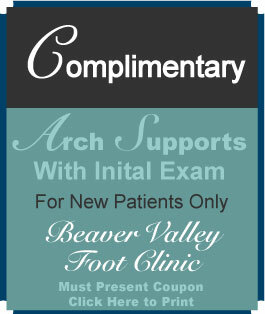 Consult with your foot doctor on which type of treatment is best for you. 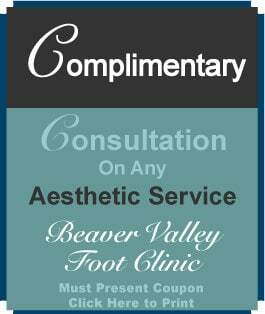 At the Beaver Valley Foot Clinic, we provide all of the services your feet need to be completely healthy, from heel to toe. “I’m very clean…how did I get these disgusting nails?” is a question that I hear everyday. Fungal infections of the nails are not related to personal hygiene. Every person in the world has fungus living happily on their skin, which usually doesn’t cause a problem. So, no, ladies, sorry—this time you can’t blame your husband for contaminating the bed or the shower and giving you those thick, ugly nails. An injury to the nail bed is the most common factor in causing fungal infections. Younger patients ages 15 to 45 who are athletic, such as runners and tennis players, may have chronic repetitive injuries from their nails jamming in their shoes. Other patients may have experienced one big injury that badly damaged the nail all at once, such as opening a door onto the nail, someone stepping on it or dropping something heavy on it. When this happens, the nail gets lifted, and fungus gets underneath it into an area of the body that is normally protected. 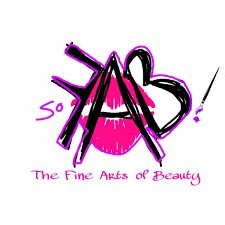 It may lie dormant for years or the nail may start to discolor very quickly. Fungus is opportunistic. As the body’s natural immunity diminishes after age 65, fungus slowly starts to take over nails—this is in addition to increased incidences of poor circulation either from smoking, diabetes, high blood pressure, cancer or many other chronic diseases. Whatever the reason, we now have many treatments to cure nail fungus that really work! 1. Laser Treatment: Laser treatment is the newest innovation in the elimination of toenail fungus. Quick and painless, it has proven to be effective for the treatment of mild, moderate and severe cases of toe-nail fungus. The treatment you decide to use will depend upon the severity of your toenail fungus. It is always in your best interest to consult your podiatrist in order to obtain an accurate diagnosis and the best treatment options available. 2. Prescription Topicals: Improved topical are available that can only be prescribed by your Podiatrist or other Physician. Jublia (10% efinaconazole in a topical solution) and Kerydin ( 5% Tavaborole topical solution) are 2 FDA approved topical antifungals. 3. Topical Treatments: Antifungal creams work for athlete’s foot, but not on a fungal infection in the toenail. Over-the-counter creams are not able to penetrate the nail plate. Your podiatrist’s office offers topical treatments that contain ingredients that are able to carry the medication through the nail in order to reach the fungus. It may take four to six months to notice a difference. 4. Antifungal Nail Polish: Covering a nail with polish traps moisture under the nail, and fungus thrives in warm, moist environments. A dozen colors of antifungal nail polish are available in our Beaver Valley Foot Clinic and Body Beautiful offices. 5. Oral Medications: The most commonly prescribed oral medication, Terbinafine (Lamisil), is for thicker nails not responding to other treatments. This medication gets to the root of the nail through the bloodstream and allows the nail to grow out healthy and clear of fungus. One tablet is taken daily for at least three months, and liver enzymes are monitored throughout treatment. 6. Surgical Removal of the Nail: For a recurring or severe-stage fungal toenail, surgical removal of the nail might be an option. The thickened fungal nail can be removed and a medication applied below the cuticle to permanently kill the root. This simple effective treatment is the only permanent solution to resolve this problem—no nail, no fungus. 7. Home Remedies: There is no scientific evidence that Clorox, vinegar or Vicks VapoRub effectively cure fungus. There have even been chemical burns caused by soaking feet in bleach. 8. Periodic Debridement by Your Podiatrist: Regular nail trimming by your foot doctor is the most common treatment for nail fungus and is recommended for diabetics, those taking blood thinners and elderly patients with poor circulation.When the nails become so thick and deformed that it hurts to wear shoes, this service (which is covered by most insurance companies) is recommended, especially for those who may not be able to heal properly if they injure themselves with home treatment.